eLibrary will automatically display a wide range of files. Simply drop a PDF, PPT, EXE, HTM, DOC, XLS or Movie file in module below the menu name and that file will be opened when the menu is clicked. PPT and PDF files should have local drivers installed. These are not supplied with the demo but are available separately. The eLibrary software is the most effective way to distribute and display a range of different media files, for example Adobe Reader .PDF documents, PowerPoint .PPT presentations, stand-alone executables *.exe files, Word, Excel or a web site .htm. If you want an Adobe .pdf file to appear in section 4 of the program then simply drag and drop, or copy and paste the particular Adobe file into the module4 directory. 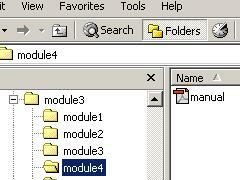 To add a Power Point presentation to section 5 simply paste your .ppt file into module5. To add an executable program to section 6 simply paste your .exe file into module6 (you may need place the accompanying .dll and content files in this directory as well). To add a website to section 7 simply paste your .htm or .html file into module7 (you will need place the accompanying image files etc into this directory as well). The number and arrangement of these directories depends on the program structure you require. When the program is running and you click on line one of a menu list the program looks for and loads the contents of directory \module1. Line two executes the information in directory \module2 etc, etc. The program will then automatically play the contents of the next directory. A small icon appears to the left of the menu screen when a file is available in the next directory. The icon picture displayed indicates the type of file available. PowerPoint and Adobe viewers can also be run from the CD using these files. Almost every independent, stand alone application runs by executing a *.exe file. These programs may include any custom or specialist applications that have already been produced or are likely to be produced in the future. The executable file must be placed in the correct directory. Often these independent programs require special *.dll files to be installed onto your computer before they will work. In many cases these will already be installed on the end users computer but you cannot always guarantee this. It may be necessary to add these files to the directory that contains the executable file for it to operate correctly. Often programs also use external files such as videos or sound. Normally you can simply copy these files onto the CD and as long as you maintain the same names and menu structure they will usually work without problem. Many programs require the user to purchase a registered copy of the application before it may be used. It is not lawful to distribute these types of programs by the above method. Often a company's web site contains a substantial amount of worthwhile information. This can often be copied onto the CD as a complete directory and displayed as the CD is used. A web browser must be installed on the users computer but no modem is required. Store the .htm or .html file in the correct directory. To view the site within the eLibrary and not in a separate browser you must request the webbrowse.ccn file within that directory's .INI file. The complete web site with all of its pages and directories must be included in the relevant directory. This utility requires the user to have a correctly configured web browser. Not all website designs are suitable for being run from a CD. You may need to consult the website designer first. eLibrary will automatically open MS Word or Excel files that are saved on the CD provided the user has a copy of Word or Excel installed on their PC. If not they will be given the option of selecting an alternative program they wish to use to view these files.